Latest Update: Links updated for SAP S/4HANA 1809. Also please note that notifications can also be provided by SAP CoPilot as of SAP S/4HANA 1709 FPS01, and subscribed SAP Smart Business threshold violation alerts as of SAP S/4HANA 1809. The newest and for some people the most long-awaited features of S/4HANA and Fiori 2.0 is the Notification Center. The ability to immediately notify someone of an action requiring their attention goes to the heart of typical Digital Transformation Goals for User Experience, such as Insight to Action and Processing by Exception. This blog explains how to turn on the Notification Center, explains some general principles, and shows how to configure Workflow Notifications to appear in the Notification Center – SAP Business Workflow being the first Notification Provider released with S/4HANA 1610 and above. Finally we introduce how end users can work with and personalize the Notification Center. Every time I’ve talked to customers and partners about Fiori 2.0, people always ask me about notifications. It’s been consistently one of the top long-awaited features of Fiori 2.0. So when you are on S/4HANA 1610 – and therefore Fiori 2.0 – of course you want to turn it on and try it out. We will assume that we are running S/4HANA 1610 or above with Fiori Frontend Server in Hub mode or SAP S/4HANA 1709 or above with Fiori Frontend Server in embedded mode. Note that the recommendations for embedded vs hub mode were changed as of December 2017. You can find more information on the latest Fiori Deployment Recommendations and Options. In practice, the configuration is much the same – the only difference is the target of your RFC destination behind your System Alias. Note: Personally I find it useful to use a well defined logical system alias name so that the direction of information flow is always clear. Because we are using SAP Business Workflow as an example, we will assume that Fiori My Inbox is already activated including any Task-Specific extensions. Note: We need this because when we click on a notification we want it to take us to the matching task in Fiori My Inbox. 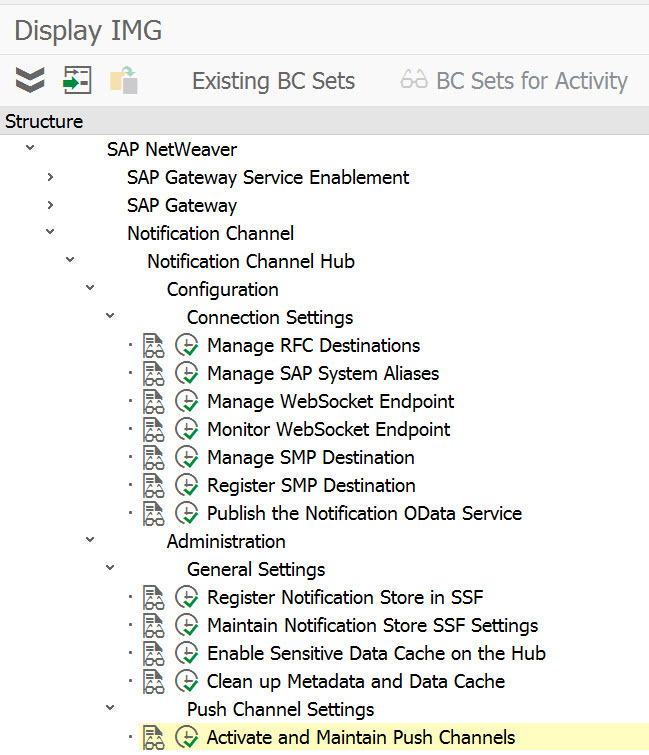 Creating a Notification Provider – for that try the SAP Gateway Foundation documentation re Develop Notification Provider for your SAP S/4HANA version. We will use SAP Business Workflow examples in this blog as that is the more common scenario for customers transitioning to S/4HANA from predecessor SAP platforms, and is the default workflow environment provided in the S/4HANA core server from 1610 and above. NOTE: The screenshots in this blog are based on a S/4HANA 1610, Fully Activated Appliance trial system in the Cloud Appliance Library. You can create your own trial system if you want to try activating the Notification Center for yourself. Find the latest available S/4HANA trial systems on the S/4HANA Trial landing page. While you only need one Notification Center and one Notification Hub, there can be many providers. SAP Business Workflow can provide notifications. You can expect that providing notifications is in the roadmap of several Cloud and On-Premise SAP solutions. Lastly you want to make sure your users know how to make the most of the Notification Center so we’ll point to the user guides that will explain general notification behaviour and personalization options. The Notification Center is part of the Fiori Launchpad in Fiori 2.0. This means you must have Fiori Launchpad that supports Fiori 2.0, such as Fiori Frontend Server 3.0 or above. Always check the SAP Fiori for SAP S/4HANA Release Information Note for your SAP S/4HANA version to check which Fiori Frontend Server is available. Note: Fiori Frontend Server 5.0 must be used by SAP S/4HANA 1809 and can be used by SAP S/4HANA 1709 SPS03. Note: Fiori Frontend Server 3.0 is required for S/4HANA 1610 and not available for S/4HANA 1511. NOTE: Fiori 2.0 is also available from S/4HANA Cloud 1608. If you are using an on-premise SAP Gateway you must be on SAP NetWeaver version 7.51 or above. If you are using SAP S/4HANA, please make sure you always refer to the documenation for your SAP S/4HANA version. If you are NOT using SAP S/4HANA please make sure you refer to the correct documentation for your ABAP Platform or NetWeaver version. You also need a Notification Provider. For example, from S/4HANA 1610, the S/4HANA system acts as a Notification Provider, e.g. for SAP Business Workflow Notifications. The Notification Center needs to be enabled in the Fiori Launchpad in your Fiori Frontend Server. When you install S/4HANA 1610 or above, the Fiori Launchpad is configured to show the Notification Center by default. If for any reason you want to defer turning on Notifications until a later time, you will need to know how to find this configuration and change it. The configuration sits in the FioriLaunchpad.html file which is part of the BSP Application /UI2/USHELL that controls the Fiori Launchpad. You can find the BSP application using transaction SE80. The snippet that contains the parameters for Notifications looks like this. Tip: The FioriLaunchpad.html file is delivered by SAP. You should avoid changing this file directly, your changes might be overwritten when you upgrade or update your system to a new release or support package. During the upgrade or update, you will need to adjust it again. Instead consult the Fiori Launchpad Administration Guide for your SAP S/4HANA version for recommended options on how to Configure Launchpad Settings. 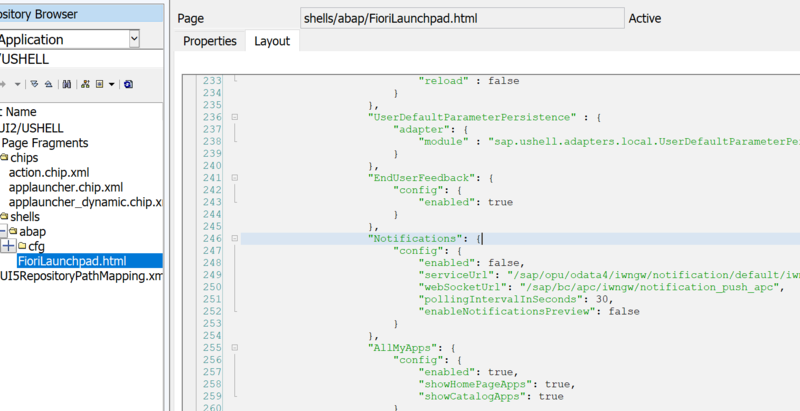 You can find more information on the other notification parameters in the official SAP documentation for the Fiori Launchpad – Enabling Notifications in the Launchpad. Tip: Even though the Notification Center is turned on by default in S/4HANA 1610, nothing terrible happens if you haven’t yet activated the Notification Channel. However you might notice some rather repetitive error messages in the Console of their Web Browser Developer Tools complaining that the notification OData service is not available. The SAP Help documentation for setting up the Notification Channel is found in the SAP Gateway Foundation documentation in the section Notification Channel. Always make sure you refer to the correct version of the help for your SAP S/4HANA version. You find all the steps you need in the IMG (transaction SPRO) under SAP NetWeaver > Notification Channel Hub. This is one of the first OData version 4 services to be released. You activate this service in the new OData version 4 transaction /IWFND/V4_ADMIN – and not the predecessor transaction /IWFND/MAINT_SERVICE that you use to activate OData version 2 services. You can also activate the service in the IMG (transaction SPRO) section Publish the Notification OData Service in the Configuration section for the Notification Channel Hub. Publish the service group /IWNGW/NOTIFICATION in System Alias LOCAL – i.e. the service will run in the SAP Gateway. You should then see the OData version 4 service /IWNGW/NOTIFICATION_SRV is active in the Available Services section. Notifications use an ABAP Push Channel to push notifications to the Fiori Launchpad. The recommended approach is to use a Web Socket connection for this purpose. You can also activate the Web Socket in the IMG (transaction SPRO) section Manage Web Socket Endpoint in the Configuration section for the Notification Channel Hub, or just go directly to transaction SICF. Add the SAP_WEBSOCKET channel to the list of Push Channels supported by in the IMG section Activate and Maintain Push Channels. As always after changing configuration settings, make sure you clear the cache using IMG section Clean Up MetaData and Data Cache or transaction /IWNGW/H_CLEAR_CACHE. Tip: To regularly clear the notification data cache, check the notification clean-up utility job /IWFND/NOTIFICATION_CLEANUP is active in transaction SJOBREPO. Your notification users and administrators need certain permissions. The Notification Channel User Roles and Authorizations are listed in the SAP Gateway Foundation documentation. Always check you are using the correct version of the help for your SAP S/4HANA version. To check your notification hub is working you can use the Demo Content provided for this purposes. Follow the instructions and then run transaction /IWNGW/BEP_DEMO to send a demonstration notification. If you haven’t used ABAP Channels before, you can find more information on ABAP Channels in the blog Introduction to ABAP Channels. In Part 2 – Providing Notifications we’ll look at how to turn on notifications for SAP Business Workflow and give a brief summary what your users will need to know to make the most out of Notifications. If you are not seeing the option in the Site Settings Editor and you are definitely on Fiori 2.0 then I would suggest raise a support message. Mystery solved, Jocelyn. If you set the UI5 version to 1.44 then the ‘Notifications Area’ option is enabled (in the Fiori Configuration Cockpit). With 1.42 you get a ‘2.0’ launchpad but no option to include notifications. Nice blog. This helps consultants to implement the notification center. Customers are excited about using S/4HANA with Fiori 2.0. Thanks for sharing, I am unable to receive notifications at my end even after making configuratios. I am facing this issue from last 16 days and still things have not yet solved. The steps that your document mentions have been implemented in my Demo21 system but still no luck. I notice in the thread you have already been through a lot of diagnosis and adjusted a lot of config… and reached a point where you have been asked to raise a Support Message. I did all of the above against a S/4HANA 1610 Fully Activated Appliance trial system and it worked perfectly. One thing I could suggest – I notice you have used a test user ABCUSER in some of your screenshots. When you are setting up new functionality its always a good idea to use a user id that has the SAP_ALL and SAP_NEW profiles assigned. This prevents you from hitting authorization issues. In the section Testing the Notification Hub above I included the link to the authorizations documentation. If its not authorizations then please go ahead and create a SAP support message. great blog. Thanks for sharing it. I have one comment: You don’t necessarily need to change the launchpad config file to enable the notifications. This can also be done via a Target Mapping. Alan recently wrote a blog post how to do that. The documentation about the parameters can be found here. Thanks Sascha – yes thanks for adding the link to Alan’s post. does someone know if this is also possible – and how – when using Fiori 2.0 and ERP Backend. We did some customizing , are able to subscribe to an Entity, but have problems when it comes to den rest-client SEND method. or in other words, is is already possible to receive these notifictions than in the launchpad ??? I’m not quite sure what you are asking? I take it you are using Fiori 2.0 on a Fiori Frontend Server 3.0 (i.e. SAP Gateway 7.51 with SAP_UI 7.51) in a hub mode with a backend SAP Business Suite or Suite on HANA? In that case you would have the Notification Center in the Fiori Launchpad – although you will need to explicitly enable it. You will also have the Notification Hub as your Fiori Frontend Server 3.0 can act as that and you should be able to run the demos. However you will need to create your own custom Notification Provider as you will not have one in your backend system. we have activated the Notification-Button in der Launchpad. We also subscribed to one entity successfully. We have our gateway on the ERP EHP7 system. Does this only works with a system > Netweaver 7.50 (ERP ehp7 is NW 7.40) ?? As per the steps in section Activate the Notification OData Service above that OData Service should be run against the LOCAL system alias in your Fiori Frontend Server 3.0. Your system needs to support the minimum prerequisites for OData version 4, i.e. SAP Gateway 7.50 SP04. Just reminding also that this blog was aimed at S/4HANA 1610 sites – which would already be on Fiori Frontend Server 3.0 i.e. SAP Gateway 7.51. So you may find some other differences when running against Business Suite or Suite on HANA. Did you solve this issue ? We don’t have HANA but the same SAP UI 7.51, backend ERP EHP7. I am still facing issues to get the data from Back-End. no as far as i know it is not possible with EHP7. You need to have something like EHP8 or above with NW 750 and above. as we have EHP7 and FioriServer on the same server, we have to upgrade to EHP8 which is planned in autumn. Maybe when you have the frontend-server not on the same server as the backend you can upgrade the frontendserver to NW 750.
with EHP7 the oData V4 things are not there, only with EHP8 (Gateway 750 SP4). Thanks for the information Oliver. I have configured Notifications as per your steps in our S4Hana 1610(Embedded Architecture) Landscape. Supervisor destination BGRFC_SUPERVISOR already existed in the system. Please post your question as a question…blog comments are not a good place to resolve specific issues. That said I would not concern yourself with the bgrfc monitor for notifications. The monitor is not something you need for this & I excluded it because it does not show anything useful re notifications. Please continue with the rest of the setup. Thanks for the grat blog, however I am getting stuck at the step /IWNGW/BEP_DEMO. WHen I execute this transaction, I get Test Create Notifiation as not active. Check you have registered and activated the demo notification provider using transaction /IWNGW/BEP_NPREG and activated it in transaction SM30 /IWNGW/VB_REG_P as described in the Demo Content . Some pretty confusing statements. Above you said that as part of Fiori 2.0 with business suite setting up notification is possible. But as part of SAP fiori 2.0 guide, they say that its not possible. Could you help validate this statement ? 2.3 The Fiori 2.0 User Experience for SAP Business Suite SAP Fiori 2.0 technology is also available as an option for the SAP Business Suite, via Front-End Server 3.0. Everything is provided with Fiori 2.0 on S/4HANA – Notification Hub, Notification Center, and Notification Provider. However when you use Fiori 2.0 and Business Suite or Suite on HANA you need to be more careful… some of these features depend on the release/support pack level of your Fiori Frontend Server. So you want to be on NetWeaver 7.51. Also you do not get any provided notifications – so you must build your own. That is what is meant by the above statement “do not provide integration with Fiori notifications”. Also you want to take note of Alan Rickayzen’s blog https://blogs.sap.com/2017/02/15/configuring-fiori-launchpad-for-push-notifications-loose-ends/ to add in those loose ends..
Meant to say.. NetWeaver 7.51 is preferred – as that is what we use for S/4HANA. You can go down as far as NetWeaver 7.50 SP04 as per my previous answer. However I generally advise going to 7.51 if at all possible as there are other benefits for Fiori Launchpad and Fiori apps performance. I think there are some confusion caused by the welcome pack master document as it does not really say what is the required front-end/back-end requirement to do the Fiori Launchpad push notification. We upgraded our front-end gateway to Netweaver 7.5 and our backend system to SAP ECC 6.0 EHP8 to have this feature. So if i understand correctly, the default notification feature from SAP inbox is not available on SAP Business Suite, but only available at SAP S4/HANA? So if the inbox integration is required, then it is something we have to develop on our own? Another thing that I’m not clear is the front-end gateway requirement to enable push notification, based on the thread, I think we’d need our gateway to run on Netweaver 7.51? NetWeaver 7.5 is fine for ABAP Push Channels and Fiori 2.0 as per the recommendations in the Fiori 2.0 Welcome Pack. “Note that the SAP Business Suite systems do not provide integration with SAP Fiori notifications “. Other solutions also starting to provide notifications, such as SAP CoPilot which uses notifications from S/4HANA Cloud 1705. And I understand SuccessFactors is also considering using notifications although you would need to confirm that officially if that’s of interest to you. It’s unfortunate that you upgraded to 7.5 & ECC 6.0 EHP8 for this without reading the Fiori 2.0 Welcome Pack carefully or getting advice/confirmation from SAP on this point. I’d query whether such a significant upgrade was done for notifications alone. Hopefully the other reasons for upgrading still provide sufficient business benefit to justify your good work in upgrading. Even i am not technical person. getting information in your blog is more helpful to get solid decision. Expecting for a early response. Please remember that this is SAP Community and not official SAP Support – you are always welcome to raise an incident if you can’t work something out. I’m guessing you have missed one or more steps in configuring the Notification Channel … as referenced in the blog above. I don’t repeat all those steps in the blog because it’s documented very well in the standard documentation. Thanks for your well explained blog series. We are trying to build a scenario,where we want to show task notification of NW BPM system (like UWL in portal) in fiori launch pad. Can you please guide us how we can configure notification in Gateway for NW BPM?